Your hair is falling out for no apparent reason. You have inexplicable bouts of heartburn accompanied by bloating and belching. You are chronically fatigued. You seek help from a chronic fatigue syndrome support group. You cannot get pregnant, forcing you to pursue help at a fertility clinic. You are an insomniac and go begging for a normal night’s sleep. Your doctor, after repeated visits to his office, says your fatigue and dizziness upon standing from a sitting position is related to low vitamin B12 levels and provides you with a B vitamin supplement. A bone scan reveals you have premature bone loss (osteoporosis). The fluid pressure in your eyes is elevated and your eye doctor is concerned you may be developing glaucoma. Your immune system apparently isn’t up to par because you have frequent sick days from colds, allergies and the flu. You are taking thyroid hormone pills and your hormone levels continue to vary widely resulting in a wide variety of symptoms. You have been diagnosed with anxiety disorder and given mood-boosting drugs. Your doctor wants you tested for premature Alzheimer’s disease. You have a chronic and unremitting migraine headache for which your doctor is perplexed how to extinguish. Doctors often call these idiopathic disorders, that is, “conditions arising spontaneously from an obscure or unknown cause.” Modern medicine says it doesn’t know what causes Alzheimer’s, cancer, migraine headaches, and many other maladies. Could there be a common cause? Because modern medicine is compartmentalized into specialties that are divided anatomically (eyes, brain, lung, heart, etc.) or systemically (endocrinology, hematology, immunity, allergist), any trigger for a broad disease that crosses over the borders of these specialties is likely to remain obscure. Even the etiology of a single disease, stomach ulcers, that is now known to be caused by this bacterium, remained obscure for decades. That is because the germ this report addresses is a stealth bacterium. Maybe half the planet’s human population is infected by this pathogen and while research on this bacterium has been avid, little progress has been made in understanding how it is transmitted. Furthermore, while it is said that maybe 30% of children and 75% of adults in undeveloped lands are infected, the dilemma is how to treat such a highly prevalent infection with a battery of antibiotics that will surely produce drug-resistant strains. So only those few cases, maybe 1%, that go on to develop bleeding gastric ulcers will get treated. Modern medicine largely ignores this infection otherwise. No preventive measures are in place. Modern medicine knows how to treat, but it doesn’t know how to prevent. While the prevalence of this bacterial infection is much lower in developed countries, what is not said is what likelihood there is that ANYBODY living a normal lifespan will NOT acquire this infection. It’s likely every human on the planet will suffer with the symptoms caused by this nasty germ over their lifetime. This report is written to help fill the void in between infection-induced symptoms and positive diagnosis. Not only does modern medicine often fail to link this infection with its highly variable symptoms, but many sufferers never go to the doctor, thinking their problems are common for their age or whatever. The germ is Helicobacter pylori (also known as Campylobacter), a spiral-shaped bacterium that uses its flailing tentacles to dig into the mucus lining of the stomach and reside there. H pylori is a pretty brainy bacterium evidenced by the fact it has found a nice place to get fed every day – the human digestive tract. Medical specialists don’t know whether various common factors cause H pylori or just are associated with this bacterium. The difference between a cause and association can be explained this way. For example, if it is found that 90% of children involved in pedestrian accidents were wearing tennis shoes at the time of their accident, it is obvious that the tennis shoes were only associated with these accidents, not a cause of the accidents. A 15-year old girl continues to experience unexplained fainting spells. She is found to be anemic but it takes time to find that an H pylori infection is the cause of her symptoms. Successful treatment with antibiotics caused the fainting spells to disappear. In up to 30% of patients with anemia no underlying cause can be found. Some researchers suggest anemia of unexplained orgin may be induced by H pylori infection. Some anemic patients treated for H pylori infection have experienced resolution of their chronic anemia. Many millions of dollars of anti-anxiety medicines are prescribed annually. The origin of the anxiety is often never determined. However, it has been observed that patients with peptic ulcers, which are known to be caused by H pylori infection, are 280% more likely to experience anxiety. H pylori infection appears to be associated with glaucoma (abnormally high fluid pressure in the eyes). Helicobacter pylori was detected in 88% of glaucoma cases and in 47% of healthy adults. When H pylori is eradicated measurable improvement in glaucoma is achieved. The connection between H pylori and glaucoma is suspected to be increased free radicals and inflammation. Eye physicians are not likely to suspect or treat H pylori when glaucoma is diagnosed. Fertility clinics abound. Few women know that H pylori infection interferes with the progression of sperm in the cervix. Unexplained infertility may be rooted in H pylori infection. H pylori infection is also implicated in polycystic ovary. Women undergoing thyroid hormone therapy frequently find their hormones levels vary widely, producing many undesirable symptoms that requires doctoring. H pylori infection interferes with the absorption of thyroxine, which is a common cause of such side effects. H pylori infection is highly prevalent among Alzheimer’s disease patients. In one study 88% of Alzheimer’s subjects had H pylori detected compared to 47% of healthy subjects. When H pylori was eradicated in 50 patients, they experienced measurable improvement in brain function. Researchers say this means there is a possible link between H pylori and Alzheimer’s disease. Some 12-15% of humanity suffers with recurrent migraine headaches, often of unknown origin. Chronic, recurring migraine headaches may be rooted in H pylori infection. Active H pylori infection is strongly related to the outbreak and severity of migraine headaches, and H pylori treatment reduces migraine headaches significantly. Migraine is often accompanied by gastric reflux (stomach acid rising up into the esophagus or throat producing symptoms known as heartburn) is a common sign. The H pylori infection origin of migraine is more highly suspected among individuals with aura (visual disturbance).While there are mixed reports concerning a link between H pylori and migraine, one study reports about 8 in 10 migraine patients report relief when H pylori is eradicated. Surprisingly, estrogen levels have been found to be lower in H pylori-infected individuals. This may lead to bone loss (osteoporosis) as estrogen sends a signal to hold calcium in bone. Men who develop osteoporosis are more likely to be H pylori infected. The provision of estrogen actually protects against H pylori induced inflammation. Since loss of estrogen induces other problems, such as insomnia and mental depression, hair loss, these should be added to the list. There are many other maladies outside the digestive tract linked to H pylori infection. The list includes respiratory disorders (chronic obstructive pulmonary disease, bronchiectasis, lung cancer, pulmonary tuberculosis, bronchial asthma); blood vessel disorders (ischemic heart disease, stroke, primary Raynaud’s phenomena, primary headache); autoimmune disorders (Sjogren syndrome, Henoch-Schonlein purpura, autoimmune thrombocytopenia, autoimmune thyroiditis, Parkinson’s disease, idiopathic chronic urticaria, rosacea, alopecia areata); and other disorders (growth retardations, liver cirrhosis). So far, there is not convincing evidence that eradication of H pylori ameliorates all of these conditions. H pylori is a spiral-shaped bacterium, which was established in 1982 by Australian researchers Robin Warren and Barry Marshall as the cause of gastritis and peptic ulcer. For this they were awarded the Nobel Prize for medicine in 2005. Prior to that time physicians treated ulcers with acid-suppressing drugs, believing ulcers were induced by mental and physical stress. But Marshall and Warren removed the false notion that stomach ulcers originated in the mind. Shamefully, the FDA allowed antacid/anti-ulcer drugs to be sold till their patents expired, and only then approved antibiotics for treatment of stomach ulcers. Over 80% of people infected with H pylori show no symptoms. Helicobacter pylori is one of the human pathogens with highest prevalence around the world; yet, its principal mode of transmission remains largely unknown. The epidemiology of H. pylori infection is characterized by marked differences between developing and developed countries, notably among children. The country you reside in predicts your chance of acquiring H pylori infection. Generally, poorer countries with inadequate sanitation and poor nutrition experience higher rates of H pylori infection. H pylori inhabits the stomach of more than half of the world’s population. That is about 3 billion people. Of those infected, about 10% develop peptic ulcer disease and roughly 1% develop gastric cancer. The following is a selected list of countries with estimates of prevalence of H pylori infection. While the prevalence of H pylori is far lower in western developed countries, the most common strain (50-70% of those infected) of this bacterium is the cag strain which is the most pathogenic (causes the most tissue damage). Despite over 40,000 published scientific reports on H pylori, no one conclusively knows its primary route of infection.The greatest risk factor is living with a mother infected with H pylori. This author suspects that contaminated water is the primary route on infection since every child has a mother, but the rate of infection is more dependent upon country. Poorer countries are known to have poorer sanitation. H pylori can be transmitted by the waterborne route. Furthermore, H pylori can survive chlorination and remain undetected by culture methods. It is possible that water suppliers don’t want this known as it could reduce reliance upon tap water and increase consumption of bottled water. While there is treatment, there is not necessarily foolproof eradication. Treatment failure exceeds 20% and greater efforts to quell this common pathogen which leads to more antibiotic-resistant bacteria. However, there are reports of 90% eradication rates with very aggressive multiple antibiotic regimens. The gold standard in the eradication of H pylori is one-week triple drug therapy (one antacid, two antibiotics). Recurrence rates are generally low following treatment, about 2-3% in developed lands and as much as 13% per year in undeveloped countries. Generally, non-antibiotic drug therapies for treatment of H pylori have remained underexplored. Urease is a critical enzyme upon which H pylori depends for its replication. H pylori produces large amounts of this enzyme which breaks down urea into carbon dioxide and ammonia which then converts to ammonium that neutralizes stomach acid. The lack of stomach acid then results in nutrient malabsorption and increases vulnerability to infection from other pathogenic germs. Urease inhibition is a strategy to prevent H pylori infection. A number of foods are generally associated lower rates of H pylori infection. Some of these include garlic, green tea, red ginseng and broccoli sprouts. Natural therapies that may inhibit or eradicate H pylori include vitamins, herbals and probiotics. Plant extracts may work by (a) disrupting the cell membrane in H pylori bacteria; (b) inhibiting urease, the enzyme needed for H pylori survival; (c) elevation of the immune response to kill off H pylori, or (d) inhibit adhesion of H pylori to tissues. H pylori infection is associated with malabsorption of essential nutrients. H pylori blocks nutrient absorption by a reduction in production of stomach acid. 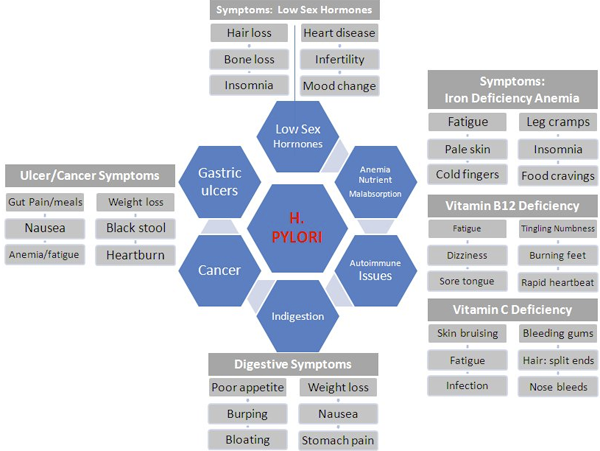 The list of nutrient shortages induced by H pylori includes iron, vitamin C, vitamin E, vitamin B12, vitamin A and folic acid. The eradication of H pylori has been shown to increase acid secretion. Iron deficiency anemia is often improved following eradication of H pylori. Because H pylori infection interferes with absorption of essential nutrients, it is important to supplement with critically important nutrients to ensure vitamin deficiencies do not arise. Vitamin supplementation is also helpful in reducing rates of infection and staving off serious disease caused by H pylori infection. For instance, in China a long-term (7.3 year) study revealed that vitamin supplementation (vitamins C, E and selenium) nearly halved the risk for death from gastric cancer. In one study, the addition of 500 mg of vitamin C to triple-drug therapy increased the H pylori-eradication rate from 48.8% to 78.0%. H pylori appears to lower vitamin D blood levels. In Italy researchers found that H pylori-infected patients were severely vitamin D deficient (11.1 ng/ml, where 20 nanograms/milliliter is considered a frank deficiency). Healthy subjects didn’t fare much better, exhibiting a vitamin D blood concentration of 21.3 ng/ml. High dose vitamin D produces a natural antibiotic peptide in the body called cathelicidin which has been demonstrated to kill H pylori. In one study, during antibiotic therapy, the addition of 1000 mg of vitamin C and 400 IU of vitamin D increases eradication rates from 45% to 82.5%. A high concentration of vitamin C in gastric juice may inactivate H. pylori urease, the key enzyme for the pathogen’s survival and colonization into acidic stomach. However once infection established, urease is not very important for its survival. The role of vitamin C as anti-H pylori agent in peptic ulcer diseases appears to be preventive rather than curative. However, H pylori depletes vitamin C from the body and should be taken during therapy as well. Zinc carnosine deserves special attention as a non-prescription remedy for H pylori given it is fairly well documented and not costly. It is an approved drug in Japan. In one human study, zinc carnosine improved eradication of H pylori after antiobiotic therapy from 86% to 100%. Researchers in England tested various herbs and plants for their anti-H pylori activity. A number of herbs were boiled to produce a hot-water extract and then tested in lab dishes for their ability to kill off H pylori. The importance of this study is that it did not use more expensive commercially available alcohol herbal extracts but rather utilized hot-water extracts obtained from common fresh herbs. While these herbal extracts were not employed in live humans in this study, and therefore we have no idea how well they would perform outside of lab dishes when exposed to harsh stomach acids, this study does indicate cooked herbs are likely to inhibit H pylori growth to some degree in humans. Source: World Journal Gastroenterology 2005 Dec 21; 11(47):7499-507. Blackcurrant seed oil and broccoli sprouts: New Zealand researchers found that a combination of broccoli sprouts and blackcurrant oil had the most noticeable effect against H pylori. Cinnamon and thyme: another study found cinnamon and thyme extracts were most effective against H pylori. Licorice root extract have been found to be effective against antibiotic resistant strains of H pylori. Cranberry extract inhibits H pylori growth. Oregano oil inhibits H pylori growth. Allicin is the key ingredient in garlic responsible for the killing off of H pylori. Another human study found that standard antibiotic therapy plus 4200 micrograms of allicin produced a 90% eradication rate compared to 66.6% for the antibiotics alone. An advantage of garlic, known as “the poor man’s penicillin,” is that it is effective against bacteria that develop drug resistance — it has never been observed to develop germ resistance. It is effective against a broad spectrum of bacteria including viruses, and it works synergistically with antibiotic drugs. Garlic also kills antibiotic-resistant strains of H pylori. Because stomach acids negates the alliinase enzyme in garlic pills that is needed to convert alliin to alliinase, the primary active ingredient, only garlic cloves that are crushed outside of the digestive tract are expected to produce a sufficient amount of allicin. There is also a buffered garlic pill that resists stomach and has been proven to produce allicin. Cooking destroys allicin. Resveratrol (rez-vair-ah-troll) is known as a red wine molecule. Wine (which is an alcohol extract of grape skin) as well as commercially available grape extracts has been shown to be helpful in the eradication of H pylori. Resveratrol appears to work against H pylori by inhibition of a key inflammatory agent (interleukin-8) as well as inhibition of free radicals. Both red wine and resveratrol at relatively low concentration inhibit the growth of the strain of H pylori (Cag) that poses the greatest risk for stomach ulcers and cancer. All red wines tested show some anti-H pylori activity and resveratrol has been found to be the main active compound. Apple peel extract (polyphenols) has also been shown to inhibit the urease enzyme which H pylori is dependent upon for growth. Antibiotic regimens to eradicate H pylori can be quite troublesome. Common symptoms experienced during treatment are nausea, taste disturbance, diarrhea and pain. Only recently has it been reported that probiotics (which includes Lactobacillus, Saccharomyces and Bifidobacterium) may be helpful in alleviating these symptoms. Published studies now confirm that probiotics allay the side effects of antibiotic therapy. It has now been said that the question regarding probiotics and H pylori is not if but how much. There is a growing appreciation that probiotics used during anti-H pylori therapy can help to reduce adverse effects and improve tolerability and compliance of multiple antibiotic regimens. Probiotics are live bacteria that do not produce disease (pathology). Probiotics generally do not survive long but provoke an immune response. Probiotics, due to their acidity, also produce a direct germ-killing effect. The general belief today is that probiotics are useful but not solely able to eradicate H pylori. That idea may be changing. A study in Italy which employed eight strains of acid-forming bacteria as probiotic treatment produced eradication in 13 of 40 H pylori-infected patients whereas all 40 patients who received an inactive placebo remained infected. Supplementation with probiotics may eradicate H pylori in some cases. N-acetyl cysteine, a sulfur-based molecule available as a dietary supplement, is considered a good companion to take with other anti-H pylori regimens. Due to the wide prevalence of H pylori infection, it is suggested that humans conduct periodic cleanses of their digestive tract employing various dietary supplements (i.e. garlic, zinc carnosine, resveratrol, turmeric (curcumin), cranberry, oil of oregano (carvacrol), vitamin D, vitamin C, probiotics and selenium. Copyright 2012 Bill Sardi – Knowledge of Health, Inc. – Not for posting on other websites. We are glad to know this.